For disabled people, being hissed at is a constant bugbear. Of course, I’m not talking about people making snake-like sounds in our general direction, it’s a new term I’ve coined for that catch-all scourge of our times, health & safety! Wheelchair using friends of mine are constantly being told that they can’t do this or that because they constitute ‘fire hazards’ and the like. And we live in such a compensation-obsessed culture, that companies are being advised by their insurers to play it safe rather than using a bit of common sense. Hissing can come from the most unexpected quarters: on Saturday evening I was enjoying a swim at the Riverside health club, of which I’ve been a member since it opened in 1996. I’m a regular user of the gym and use the swimming pool at least once a week as part of my on-going campaign to retain my musculo-skeletal mobility and to keep my weight down. A few years ago, I started to experience problems with my swimming technique. I would often swim on my front and hold a float so that my head stayed out of the water rather than having to bob up and down as I had previously done. I started to notice that my left arm went cold and I had pins and needles in the fingers of my left hand. When I spoke to my physio/massage therapist, she told me that keeping my neck back in that position and swimming some 1,000m each time, was trapping a nerve in my neck and would cause me even more problems if I didn’t re-think my technique. I’m fortunate in that one of my PAs, Sylwia, is an extremely able swimmer - she used to swim and dive competitively during her teens. She’s also a fairly smart cookie. She told me I had to learn to swim all over again and that she would help me to do so. “They’re not swimming - they’re just mixing water,” she says. Once I started swimming properly, it was jolly hard work. This was normal, Sylwia said, because I was now using my muscles properly and my position in the water was as it should be. But in order to give me a bit of a helping hand, she suggested acquiring a pair of training flippers and a snorkel. I love the training flippers because they allowed me to glide through the water like a dolphin. And the snorkel was handy because it meant that I could keep my head in the water and not worry about having to raise my head every few strokes to breathe. After a few months, Sylwia told me that I could get rid of the flippers because my muscle strength had improved sufficiently for me to propel myself through the water unaided. I was a little disappointed at first, but now I’m very used to swimming with just my snorkel and goggles. Last Saturday, a young woman dressed in a tailored trouser suit was perched on the high stool where the lifeguards normally sit. While I was swimming she came and had a word with Sylwia. Didn’t Sylwia realise, the duty manager asked, that equipment like snorkels and flippers contravened company safety policy? While its facilities are fabulous, Riverside has always been poorly managed - things have scarcely improved since it was taken over by Virgin Active. Sylwia wondered why there should be a problem with my snorkel. “Well, the thing is, it’s hard to check whether people are breathing when they use them,” the manager explained. When I’d finished my swim, I went to have a word. I patiently explained that speaking to a disabled person’s PA, instead of speaking to them first, was extremely poor etiquette. 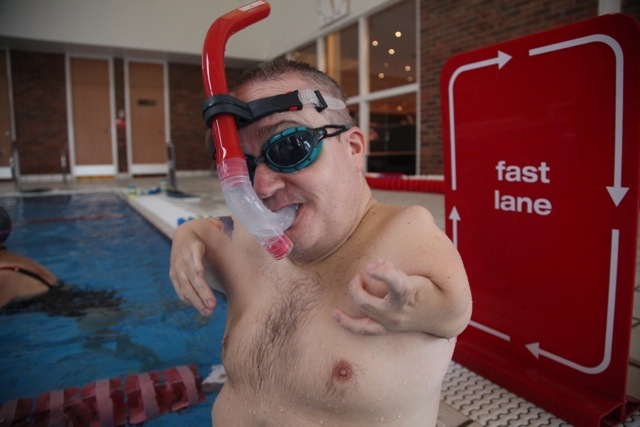 I went on to describe the reason for the use of my snorkel which, by this time, the duty lifeguard had already pronounced as acceptable to the besuited manager. I also pointed out the folly that lead to the assumption that someone who was swimming might not be breathing. Given that she had already confirmed that she was a trained lifeguard, I found this slightly disturbing. More disturbing still was the idea that her smart business suit was appropriate attire in which to jump into a pool and rescue someone in difficulty. Now, I wonder what Virgin Active’s health and safety policy would have to say about that?